The Duplex 350 Base Escalator Cleaner offers not only exceptional performance but also incredible value for money. Perfect for routine maintenance cleaning of escalators and travellators its entry level price makes it a popular choice. With a simple change of brushes, tanks, and cover, it also has the added option of transforming itself into a standard or steam Duplex 420 floor cleaning machine. 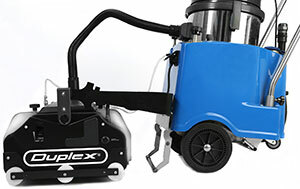 The Duplex 550 Professional is the preferred alternative when a dedicated machine is required to clean a large number of escalators/travellators and has a variable solution feed so that a range of demands can be met from daily maintenance to heavy deep-cleans. Both models feature an auto guide system which perfectly aligns the machines in the escalator tread to enable safe operation. A sweeping function is performed to remove dust followed by scrubbing with a fine mist of cleaning solution meaning minimal water usage, which is a key requirement prescribed by escalator manufacturers. The brushes have been designed to reach fully into the escalator treads where dirt and grime accumulate and both models are designed, like all Duplex machines to clean right to the edge. This entry was posted in News and tagged Cleaning, Hygiene. Bookmark the permalink.